Francisco F. Llorente (1886 – 1928) was born in the coastal city of Acapulco, Guerrero, México on March 9, 1886. He was the first Bishop President of the Apostolic Assembly and the only one to have died in office. A painter, he immigrated to the United States in 1909. The Lord reached him through Minister Juan Navarro and he was baptized in Jesus’ Name in 1912. He established various churches, concentrating his ministry in the largest cities of California: San Francisco, Los Angeles and San Diego. People would be slain in the Spirit as he preached and miracles followed him. 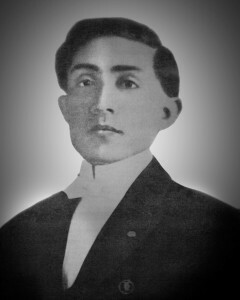 Brother Llorente was the author of many hymns, including “Jesús me habló.” His first spouse was sister Delfina Raygoza with whom he had three children. A reluctant leader, his fellow ministers elected him their General Pastor in 1925 at the first General Convention in San Bernardino, California. After this first Convention, pioneer Nava married brother Llorente with sister Juanita Peachy. Brother Llorente led the first three Conventions from 1925 to 1927, he provided the first ministers with their credentials from the Pentecostal Assemblies of the World, he established the first three districts, he presided the first Convention agreements and he published our first Doctrinal Statement. He rested in the Lord at Yuma, Arizona on September 8, 1928.